Before even powering up there are a couple interesting observations about the system. The first is the lack of power button, switch, or key. In fact there is only one button on the system and that is an indicator button which just flashes an LED on both the front and back of the system to make it easier to locate (a nice feature, by the way.) You’ll quickly find the hot-swappable dual power supply and fan compartment. The adventurous will find and the big button on top of the system which allows you to gain access to RAM and other non-hot-swappable components. All of these compartments and components are accessible without the need for tools. The hard drives are on hot-swappable sleds which pop out the front of the box. The hard drives are small (2.5″ I believe) allowing room for 4 bays in the front and still affording enough space for ventilation. I was somewhat surprised to find laptop-style drives in a Sun server, but I guess I can’t come up with any reason not to. After giving the hardware a good once-over it was time to get the T2000 up and running. I have to say Sun came up a little short on the out-of-box experience at this point. 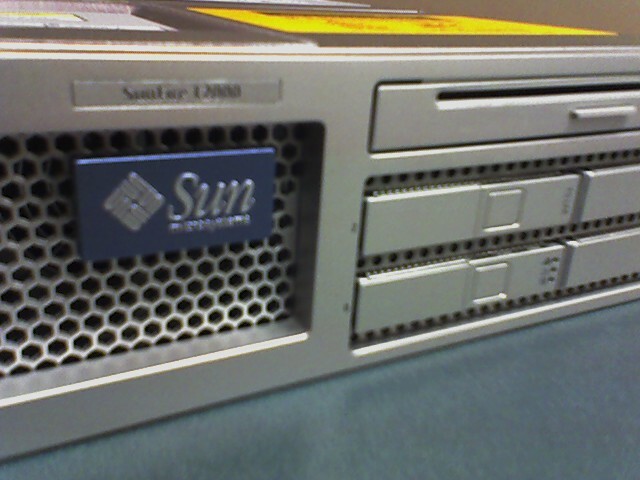 I’m comfortable with, even partial to the absence of on-board video on a server, and Sun has chosen to include serial via RJ-45 on the T2000. Sun was on the right track including two cables appropriately shielded for use with this port, but neglected to include an adapter to go to the 9 pin serial we all have on the back of our PCs. After rummaging around for the proper adapter to hook the T2000 to an old laptop we plugged it in. The system is surprisingly (read obnoxiously) loud, but hey, it’s a server not a desktop. After a few minutes of the regular hardware diagnostics stuff the system came up to an sc> prompt. This is where those who are not familiar with Sun’s newer hardware will come to a complete stop. The only documentation included with the system is the Sun Fire T2000 Server Getting Started Guide and that does little more than tell you what the different lights mean and where you can find more documentation online. If you get online and grab the Sun Fire T2000 Server Installation Guide this will walk you through dealing with the SC serial management port. In my opinion Sun should have included this one in hard copy with the system as well. After a couple more steps things start to feel familiar and the rest of the setup is much like the Solaris 7, 8, and 9 installs I’m used to. With just a few extra steps here you can (and I’d recommend) configure the SC Network Management port which will allow you the same functionality as the SC Serial Management port without the need for the serial cable and adapter. You will need an extra network drop and IP address to use network management, but then you’ll be able to telnet to it for administrative functions. Of course in a production environment you’d want this behind a firewall or on a private subnet. Other than that the system seems quick. 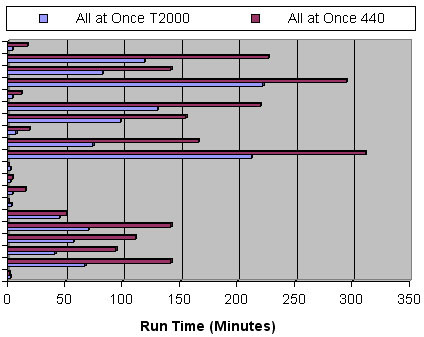 Our next step is to get Oracle on the system and throw some queries at it. I’ll share more as soon as we get some results.